You should give the file extension on the commandline. If you don't, then the 85S file will be loaded before the 86S file is. XCEdit does not read ASM text files, only binary levels. If you specify a file that does not exist you will be alerted, and asked if you would like to create that level file. If you choose to create a new level, then a blank 85S structure will be recreated in memory and you will be able to edit the blank level file. The main screen lets you edit the VAT entry name (the name of the variable as it will appear on the calculator) and the title and author for the loaded level, as well as the high score information. You can go to the graphical stage editor by pressing 4. Pressing Q will quit and save your level file as foobar. * in every format you have selected with the keys 5, 6, and 7. If you deselect all these formats, the program will not save any changes you have made. All string editing is handled by Stuntworks' proprietary single-line editor. As with all other programs that employ this editor, certain special commands are available. Pressing CTRL-X will clear the current string, for example. Future versions of this editor will allow cursor key movement and INS and DEL support. Press ENTER when you are finished editing the string. 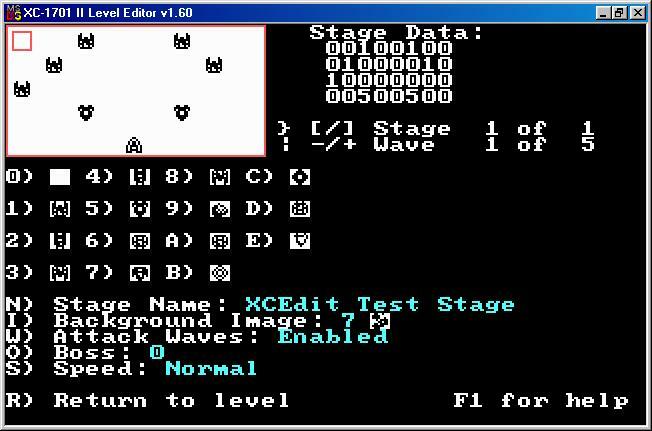 The above screen shot is of the graphical stage editor. The stage featured is a stage that I had begun for the release of XC-1701 II, but could not finish due to lack of time, and the difficulty of editing levels in ASM without a program such as this. I turned it into a quick test stage for using this editor. Use the arrow keys to position the cursor to the row you want. The stage is displayed in rows of 4, as attack waves, but you need not have attack waves enabled. Pressing the hexadecimal code for an enemy (between 0 and E) will insert that enemy at the cursor location. The hexadecimal representation of the current level is shown to the right of the display. An online help feature is available in XCEdit. If you press F1, the editor will display the name and the armor strength of the highlighted enemy. This information will help you as you design levels. This display will stay on the screen until you press F1 again. If you highlight an empty space the editor will display statistics for the player's ship. You can also edit the different attributes of the level. You can choose between 4 bosses (or "0" for no boss) and 9 background images (between 0 and 8). The current background image is printed to the right of the number. When you are finished editing the level, you can save it as an 85S or 86S file that is ready to be transfered to your calculator. However, your level can also be saved as foobar.ASM. This can be advantageous, as this file can be edited, and if you are familiar with Usgard 1.5 assembly programming you can add advanced features such as intro and ending code. If you have little or no ASM experience yet only save as an ASM file, that file will compile perfectly as is under TASM. Then you can load the resulting 85S file and not lose all your work. 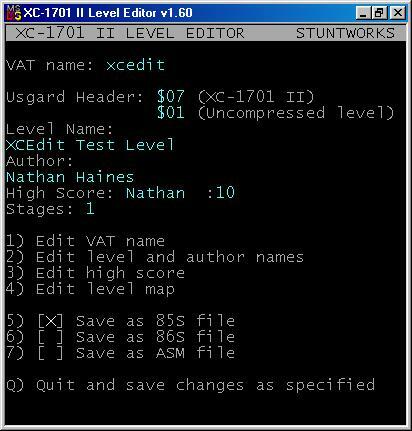 ;) The included batch file XCE.BAT was written for Stuntworks by John Hortenstine, and it is perfect for compiling XC-1701 II level files. This program is the first to make use of the advanced Stuntworks error handler. This error handler displays simple error codes and gives basic technical support for resolving them. This error handler also catches errors that were not anticipated, and displays the error number, so that you can contact Stuntworks and the support representative can help you better. The level creation guide included in XC-1701 II v1.00 is incorrect. It says to add "1" when you define the number of stages in a level. This has been verified by myself to be incorrect (and it took me a while to catch, too). Since I had to begin writing levels without a specification, I was forced to write my own working specs, and am therefore second only to Andreas Ess in level format. If you have compiled levels which have this problem, they can cause the game to crash, as well as this editor. This problem generally causes a error #9 in XCEdit. As this problem can only be caused if you have compiled an ASM file with incorrect data, XCEdit no longer has code to patch level files. If you have this problem, you'll have to fix it and recompile the ASM file yourself. Extended 85S format support to include 86S (Noooo, they are not the same thing, hehe). I didn't have the necessary information to include this in v1.5, plus, it required a major UI change. Recoding part of the UI to implement 86S support inherently cleaned up the source code. Now you can save files in any combination of 85S, 86S, and Usgard ASM formats. Much thanks to Bryan Rabeler of ticalc.org for brainstorming the new UI implementation with me. He's been an invaluble source of user feedback since v1.0. Changed the metasyntactic variable from xclevelname to foobar. This also allowed (forced?) me to add checksum checking, which was hooked in build 80803e but was not implemented. Checksum support was implemented in build 80823b but due to an unfortunate fencepost (off-by-one) error, wasn't fixed until build 80907... After this was fixed, the program ran perfectly and as expected. Running XCEdit without a filename on the command-line will invoke an intellegent directory listing: XC-1701 II *.85S files with a correct checksum (the delays are the checksum calculations). Like most of the pre-80803e builds, builds 80806 through 80907a were written and compiled on my 33mHz 386sx, and not my 133mHz 586. I didn't use my 586 for programming this time around, as the family uses it (grr... hehe). Revised this documentation, with the help of many, many Final Fantasy III MIDI files. You see, I hate writing documentation more than I hate programming. :P I updated it, redid EVERY stupid screen shot (a pain! ), and fixed several comma splices (I excel in English, but that's the only error that I make consistently! hehe). This documentation was drafted using Notepad with Internet Explorer 3.0, and proofed using Notepad with Windows 98 (Internet Explorer 4.01 Service Pack 1). No, I don't know why this doesn't display correctly in Communicator 4.5 Preview Release 1, I coded this in pure HTML 4.0 from the W3C specification, and this runs fine under IE, but not under Netscape. All I can say is that I spent a lot of time learning stock HTML with no browser extensions, and if Netscape won't support the (W3C) standard, then they'll get smoked by Microsoft (I'll also say that I liked Communicator better than IE until they stopped updating Communicator's HTML engine...). More info can be found in the program by running XCEDIT SWX. Happy fighting! [ABnormal END] Abnormal termination (of software); crash; lossage. Derives from an error message on the IBM 360; used jokingly by hackers but seriously mainly by code grinders. Usually capitalized, but may appear as `abend'. Hackers will try to persuade you that ABEND is called `abend' because it is what system operators do to the machine late on Friday when they want to call it a day, and hence is from the German `Abend' = `Evening'. Andreas Ess--for Usgard, Balloon, Sqrzx-GB, XC-1701, XC-1701 II, and countless other delightful contributions to the TI-85 community and for beta-testing this program, as well as for being a most excellent and close friend. Austin Butler--for all the stories of the amazing things (turbo, backlight, expander, speaker, did I miss something? hehe) you've done to your TI-85, and for also being such a close friend. John Hortenstine--for asking about this editor, so that it might one day be finished. ;) For being the most dedicated beta-tester, for giving all the advice I could ask on the program and the docs. He also wrote a nifty little batch file for use in compiling these levels (you should compile them without headers, BTW, XCEdit already adds in the level header. Wayne Chen--another one of Andi's beta-testers and one of my friends, for little chats, and for taking over Austin's and my Usgard project. Jim Reardon--another one of Andi's beta-testers who is also my friend, for USUL, which has been my chief Usgard programming experience. Bryan Rabeler--for giving me so much help with deciding the new UI for the enhanced saving features, and for the original news story at ticalc.org.